Origo Europae, previously Clovis: Origo Europae, is a modification overhaul for TW: Attila, with a starting date of 481 A.D. Approximately one hundred years after the starting events of the grand campaign for Attila. In Latin, this is 'The Beginning of Europe' and follows the timeline of many historical books about the age. True to it's moniker the game, which is currently in Beta, starts at two important dates, the final collapse of the Western Roman empire with the capture of Ravenna and the deposing of the boy-emperor Romulus Augustulus by the foederatus alliance led by the Heruli and their King Flavius Odoacer, and the kingship of Clovis, or Chlodovech over the Franks. This is the milestone of important events such as the Franks pouring over the Rhine and capturing the Soissons, creating a more modern view of Francia, at the date. The timeline involves historical family trees, so for example the successor to Huneric would be Hilderic, with Gelimer as another family member for the Huns, Ataulf and Alaric II for the Visigoths, Justinian for the Romans and so forth. The playable factions are, the Vandals, led by Huneric (missing his beard), the Visigoths, led by Alaric II, the Ostrogoths, led by Theoderic (The Great), the Kingdom of Italy, led by Odoacer, the Franks, led by Cholodovech, the Alamans, led by Theodehud, the Langobards, led by Tato, the Eastern Roman Empire (Roman empire) like by Flavius Zeno Augustus, The Saxons, led by Cenwalh, the Burgundians led by Gundioch, the Sassanids, Ambrosius Aurelianus, leading Britain as Arthur, The Kingdom of Soissons, led by the Roman commander Syragius, the Ui Neill, led by Lugaid (which are currently the Ebdanians led by Camulegenos), the Caledonians, and the Picts, Alans, and Bulgars led by Denzic, and Slavic Sclavenians, led by Theogisclus, and the so called White Huns, the Hephalites, led by Khingila, which make life more difficult for the Sassanids. Also, don't fear, because historical Geats, Danes, and Jutes also make an appearance, as well as the Suebians. Currently the Suebians are being used for the faction of The Kingdom of Rome, but I do expect a unique model and texture for Odoacer in the final release. What's better, the existing models are revised with each incoming release. The Frankish leader has gone through a revision to the impressive avatar that is currently in the game. Almost all of the new playable factions have custom leader avatars, which is a nice touch, and makes good use of the new models from The Last Roman. The mod itself makes use of the new resources and rosters, although your starting armies will be more in tune with the start of Attila, to make use of the tech tree. The game works with most other mods, incorporates mods such as a Frankish reskin, and allows customization of the experience through mods such as Radious, as well as unit reskins, although some issues are still being ironed out. Another item on my wishlist is for the Ostrogoths to attain use of their The Last Roman roster, once they have moved into Italy, perhaps later on their tech tree. Other factions that appear at the date are the Irish kingdom of Caer Sws, Bernicia, East Anglia, and the various groups of Slavs and Bulgars such as the Onogors that began to make an appearance in eastern Europe at the time. 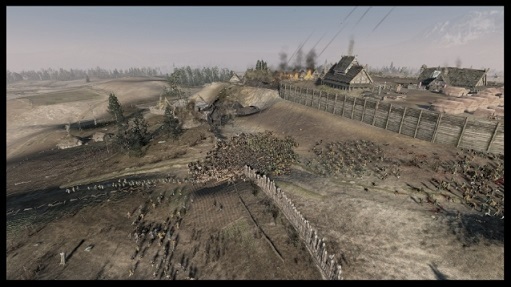 Their invasions mimic a micro version of the invasion of Attila in the original grand campaign. Also introduced are three new religions, Judaism in the Levant, Monophytism, an Armenian religion, and Buddhism. The Hunnic menace has ended, and Europe is coping with the power vacuum left by the fall of the Western Roman empire. Odoacer rules over Italy, but tentatively, as his surrounding rivals have more numerous and powerful armies and do not start on good terms with the Kingdom of Italy, to re-enact the seizure of power by Theodoric and the Ostrogoths around this date, by killing Odoacer at a banquet, and replacing his government with a more Roman friendly regime of Theodoric. The Vandals, as are historical, rule over Africa, Corsica, and Sardinia, and are in alliance with the Eastern Roman Empire, and are on good terms with the Alans, as is historical, while the Visigoths share a common bond with the Ostrogoths, and have a bone of contention with the rising Franks. The amount of detail that went into the starting alliances gives the game a sense of polish that is worthy of a major overhaul, and this appears to be the 533 overhaul everyone was looking for, albeit at an earlier date. It does look like the player is confronted with real historical figures, and the leader's avatars are given a shoulder portrait, and unique unit card for all playable factions. You can enter the hate triangle going on between Syragius, Alaric II, and Clovis, or focus on other dynamics like Hilderic's alliance with the Romans. Another great touch you'll notice is that the names of the different Germanic factions incorporate the new pools that have been created with The Last Roman, so it's very easy to tell that Gothic groups, the Franks, and the Kingdom of Italy apart from one another. One thing I am hoping for is the system of confederations that was used in The Last Roman, to recreate the Western Roman Empire, thereby infuriating the Eastern emperor and voiding your relations, giving the player a new challenge. Emerging factions are back, and the Roman system of administration that persists leads to Roman states rising up that complicate your relations with the East. Even in beta, the game plays wonderfully, with the early great income of the larger kingdoms beginning to peter out as they gain more territory and invest in the military, usually from conquests of Odoacer's kingdom. I've played as the Lombards, Vandals, the Kingdom of Soissons, The Kingdom of Italy and the Franks, and the game feels balanced in that smaller kingdoms are pressed to take more territory to avoid being eaten up. The Lombards, for example, will be forced to amalgamate smaller neighboring Germanic kingdoms like the Rugians before pressing south into what would later become Lombardy. Push will come to shove, and the AI isn't passive, and it's easy to gain a number of enemies as you expand, threatened by your greater power. 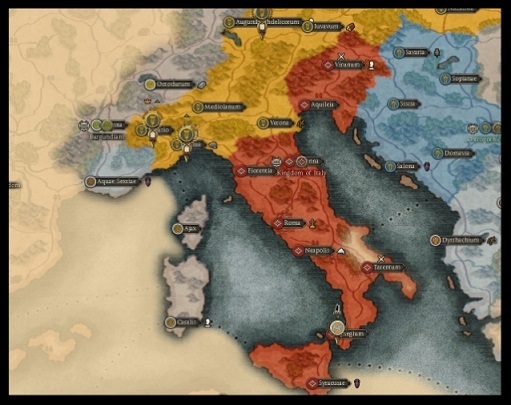 There is still room for improvement and balancing, but I can say that the AI on Hard difficulty is competent and a challenge, even for the Kingdom of Italy, which functions in the game much like the Western Roman empire, with the campaign AI making use of it's income and building more armies to defend it's vast territory. The AI also seems to take a page from The Last Roman in that there's no razing, and it makes use of a more faction driven AI that focuses on it's own interests, with the only razed settlements remaining in instances such as a buffer zone at Macomades between the Vandals and Eastern Romans, that can later be re-colonized. 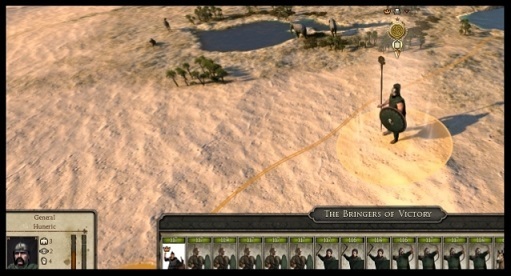 These spaces are often used in the beta for non-playable factions that have yet to be implemented, such as African factions bordering the ERE and Vandals. The faction traits work well within the timeline, and the building trees are more in line with Attila than The Last Roman. The player is allowed to build mercenary onagers from a revised mercenary pool, and this makes lightning war easier, but one always has to stay away from being over-eager, as your rivals are numerous as almost any faction, and go after the overstretched factions first. Some cities which were historically devastated at the time, like the city of Rome, remain so at the game's start date, allowing easy symbolic triumphs that put you at a disadvantageous position. The mod has enormous potential, and is already a fine Beta to play, and is a great alternative for someone who wants a new campaign experience unfettered by the seven seals or the invasion of Attila the Hun, and to play as traditional Total War kingdoms in the space they've found for themselves after the fall of Rome. It also allows players to immerse themselves in splinter states of the Roman empire such as Syragius, the Slavs and the White Huns, which are missing from the original Grand campaign. It also highlights the war between Clovis and Alaric II, which precedes the events of The Last Roman, and allows the player to re-envision the reconquest of the Western Roman Empire, or create a great kingdom in it's wreckage. I have some suggestions for the progress of the mod, but I will reserve them for the suggestions in the mod's beta thread which can be found here. Visit them to offer praise or your own input to the team. This mod comes highly recommended and I absolutely can't wait to see it in it's release form. The mod allows the player to enter the dark ages with a more traditional TW AI and faction per region schema, free from the catastrophic events of the original.